Lassie: The Perfect Dog Sets High Bar for Real Pups In books, radio, movies and television, the history of the dog Lassie is long and illustrious. In fact, some real-life pet owners expect their collies to perform like Lassie. Lassie lovers, historians and an acclaimed animal behaviorist discuss what it takes to create a great character. A six-month series exploring the great characters of American fiction, folklore and pop culture. Clarification: In the broadcast version of this report, we said that Lassie creator Eric Knight was killed in action during World War II. Knight, a major in the U.S. Army, died in January 1943, when a military transport crashed off the South American coast, killing 35. What great American characters inspire you? Nominate your favorites at NPR's 'In Character' series blog. 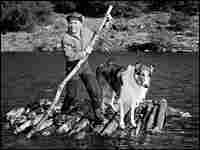 In books, radio, movies and television, the history of the dog Lassie is long and illustrious. In fact, some real-life pet owners expect their collies to perform like Lassie. Since she first appeared in print in the late 1930s, Lassie has achieved immortality. Lassie lovers, historians and an acclaimed animal behaviorist discuss what it takes to create a great character.